I have started using a WD My Passport Ultra 2Tb external Hard Drive, i have loads of photos on it, but when ever i want to remove it from the computer i always get a pop up message telling me that the drive cannot be removed safely as a program is using it yet no programs are opened, so how can i find out if any program is using it, if so how do i find which program it is, or how can i remove it safely? Its probably the back up software that came loaded on it doing a continuous back u[p to this drive from your P internal drives. If you do not want this to happen then stop the WD backup software from running at startup and delete the files from the drive. Is it not a USB connected drive? If so right click and eject it, then you should be able to unplug it safely. It is connected via usb, i will not let me eject it safely, this is the only external drive this happens to the other i have can be removed safely. won't let you eject if its in the process of writing to or from another drive. Its not writing its sitting doing nothing, the small light is lit. you need to stop the WD recovery software. I shut down the computer and removed the HD, plugged it back into the computer when it restarted it let me eject it safely, so i think the problem is to do with Photoshop or lightroom, as when i open either and do a bit of editing, shut down the programs it will not let you eject safely. "........i always get a pop up message telling me that the drive cannot be removed safely as a program is using it...............Its not writing its sitting doing nothing, the small light is lit......."
With the drive connected, go to Control Panel -> Device Manager. Expand the "Disk Drives" section then double click on your WD Passport drive. Next, click the "Policies" tab and if it's set to this option you can safely unplug the drive without using the icon - providing of course that nothing is writing to the drive and its activity light isn't flashing. 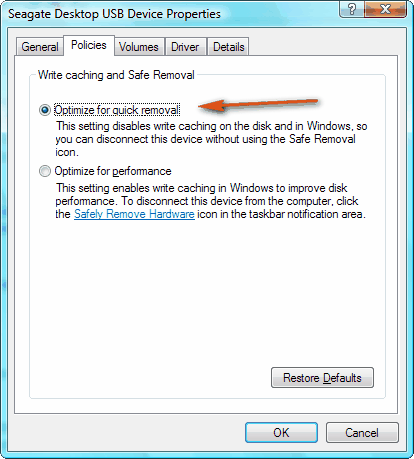 If on the other hand the policy is set to high performance then you must never unplug the drive without using the Safely Remove icon.